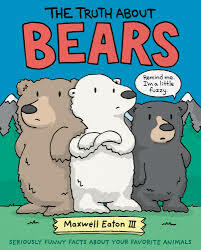 If you have students/children who love animals, are fans of Captain Underpants and other humorous tales, then these titles are a perfect gateway book to facts about Bears, Dolphins, and Hippos. Did you know that bears can be found everywhere except Antarctica, Africa, and Australia? And adult bear can weigh as much as a small car? That dolphins are playful, excellent communicators, and are one of the few animals on earth that use echolocation? That when a hippo goes to the bathroom, it flicks its tail back and forth, splattering everything that comes out? These facts and more are found in these engaging, fact-filled books. Eaton’s full page illustrations, created using pen and ink with digital coloring, include facts along with colorful sidebars that offer a bit more details. The characters, both animal and human, have word bubbles that offer a bit of comic relief. 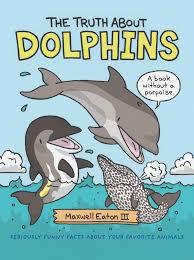 Each book moves from introducing each animal (Dolphins look like fish. But they aren’t. Dolphins are actually mammals, like humans, bears, and cats. They breathe air” and ends with the threats each animal suffers from the hands of humans. 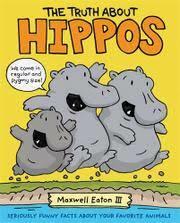 “Hippos have big teeth, but that doesn’t keep them completely safe. Common hippos are threatened by hunting. And pygmy hippos are losing their quiet forests.” Eaton states the importance of learning more about these interesting, incredible animals and sharing that knowledge with friends. Raising awareness might be the only way to save them. Back matter includes facts on each animal presented as if held in a file folder. Complete with footprint, size, territory, and other interesting facts. A listing of books for further research is also included. A fun way to engage a large crowd or draw in reluctant readers. Click here to visit Eaton's website for a peek at these books. To write this review, I borrowed copies of the books from my local public library.